SAW’s Intercollegiate Festival of Fire celebrates the transformative nature of fire. This annual collaborative event is a weekend-long exploration of the productive and performative aspects of fire in making art. The exciting schedule includes hands-on workshops, artist talks, demonstrations, performances, and exhibitions, all centered around fire. Come together to share techniques, ideas, and resources in iron casting, wood fired ceramics, glass blowing, blacksmithing, and more. Tours, gallery showings, and on-site concessions will complete the festival atmosphere and make it fun for the entire family. Don’t miss the spectacle and wonder of SAW’s Festival of Fire! Overnight guests must bring their own camping gear including tent, tarp, sleeping bag, pillow, towel, and biodegradable toiletries. Porta potties and outdoor showers are available. We also suggest participants bring closed-toed shoes, dress in natural fiber only, bring clothing layers for varying day and night temperatures. Specific items recommended include a warm jacket, hat, gloves, and rain gear, and extra pairs of wool socks. Support SAW and stay in an artist-made Arthouse! Groups may register and pay directly through our website, or email us to register to pay by invoice. Volunteers receive a reduced rate. Limited spots available. Apply below. Justin Lambert received his BFA from Florida Atlantic University 1999, and his MFA from Indiana University 2003. Justin has spent the last 18 years firing utilitarian pottery in wood burning kilns. Investigations into reduction cooling variations in the teardrop anagama adds dramatic decoration to the subtle curves in his pots. In addition to running the studio, Justin travels to teach kiln building, pottery making, and wood firing workshops around the country. Justin is also a very accomplished fly fisherman, a licensed USCG captain, and ran fishing charters for many years. He enjoys spending time with his wife Andrea cycling, snowboarding, hiking, swimming, eating delicious vegan meals, traveling, and playing with their dogs Rusty, and Daisy. My clay bodies start with porcelain, and I then blend in various other clays to help encourage the color and ash glaze achieved through the wood firing process. Wood firing in an Anagama style kiln poses many challenges, and opportunities. It's extremely labor intensive, requiring constant stoking every 5-10 minutes for a duration of 3-6 days minimum. My kiln utilizes 3 cords of wood each firing (we fire 5 times per year). I love firing with wood for many reasons. There is no other way to achieve the color, drama, individuality, and connection from maker to user. No two pieces will ever be the same, and there is no "applied" glaze separating the user from the bare clay. There are so many variables in wood firing, it's impossible to attribute any one effect to any single variable. For example, my color palette is not a result of the "clay body", it's a harmonious blend of wood type, clay body, atmosphere, firing duration, stoke frequency, humidity, wind, temperature, stoking style, etc. The Glass department offers a master glass workshop led by a guest artist. Students will explore hand-building, color application, floor marvering, working with bits, and we might even skip into the flame shop and make parts for our blown work. This intensive workshop will include demonstrations and hands-on activities throughout the weekend. Laura Donefer is an award winning artist who has been using glass as her primary medium for more than thirty five years, often in combination with diverse materials. Celebrated for her innovative, colorful blown glass and flame worked “Amulet Baskets”, she also pushes the boundaries with work that explores ideas concerning memory, assault, bereavement, joy and madness. In demand as an exciting teacher helping her students to push the boundaries of glass as an art material, Laura has taught workshops and given lectures worldwide, including Japan, the United States, China, New Zealand and Australia. Her work is many public and private collections, the Corning Museum of Glass, the Museum of Glass in Tacoma, the Museum of Art and Design in Manhattan and the Museum of Fine Art in Montreal to name but a few. Laura has been honoured with many awards, among them “Lifetime Achievement Awards” from the Glass Art Association of Canada, as well as Craft Ontario, the prestigious “Honorary Membership Award” from the Glass Art Society, for her dedication to the glass community at large, and the International Flameworking Award for “extraordinary contributions to the glass art world,” as well as being honored in 2016 with the Art Alliance for Contemporary Glass award for her role in the glass community. Every few years Laura organizes one of her wacky, exuberant Glass Fashion Shows, a fantastical spectacle for the international glass community to enjoy. The last one took place in Murano, Italy and featured 33 amazing glass costumes in gondolas going down the famous Vetrai Canal. Laura lives in the wilds of Ontario, Canada, and in her spare time grows kale, hangs out with her husband The Mighty Dave and kayaks the nearby waterways with her dachshund Mr. Lance, loving and living her life to the fullest! The iron department offers an artist talk, performance, and production pour. Friday evening showcases our iron key note artist with an artist talk and performance. Saturday we’ll have a production iron pour all day where participants are invited to bring molds to have cast in metal. The production Iron Pour is a chance for teams from across the nation to come together for a hands on opportunity to share techniques, ideas, and resources in iron casting. Participants spend the weekend working in groups to prepare and pour molds, furnace, and pour site. Contact us to reserve scratch blocks or doodle bowls and schedule a group demo! Using fire as a tool Coral Penelope Lambert is internationally recognized for working in cast iron and large scale sculpture. Born in the UK she studied sculpture in the late 1980's at Canterbury College of Art with Sir Anthony Caro and received for MFA in Sculpture in 1990 from Manchester Met University. 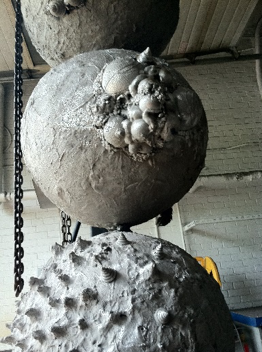 She combines her early training in formal steel sculpture with her passion for casting metal. Over the past 30 years she has utilized the foundry as her laboratory to explore the process of speeding up the work of Mother Nature. Her work responds to metals rich history in myth, landscape and mining; exploring its weight, permanence and flux as well as its political reference to the earth’s resources. She is the recipient of prestigious awards and her work can be seen across America and Europe. She is Professor of Sculpture and Director of the National Casting Center Foundry at Alfred University, NY. The lecture will precede the performance, Lambert will speak about the importance of fire as a transformative tool in her work connecting it to the history and development of culture. The talk will engage the audience in activating the performance ‘The Cosmic Furnace’ : it may involve bringing an offering to the furnace, chanting and journeying with fire to the performance site. In general my work explores forces of nature and seeks to address darker issues related to the earth’s resources such as contamination and mining. ‘The Cosmic Furnace’ is an active iron furnace that will produce molten iron. The form of it stems from my ‘Chakra’ series of sculptures which are about ideas of things being in fluctuating sync with nature; they explore ideas of coexistence, containment, resonance and metamorphosis. In the furnace design a specific number of spherical forms have become joined and dependent upon each other, this state references such things as the alignment of planets in the sky or the chakras in the body. Surrounding the furnace will be a circle of small communal fires. Offerings will be made to the furnace in the form of charges of iron created ahead of time: the iron charges will be in the form of tiny human figures. In many cultures the furnace has symbolic meaning, it is not just a piece of apparatus to heat up and purify metals. Alchemists believed that the metal (and thus the human soul) experienced suffering and mortification while being cleansed of its impurities and corruption. The symbolic act that will take place at during the performance echoes this purification. It has been theorized that the planet also has Chakras that appear as centers of high energy at sacred sites. ‘The Cosmic Furnace’ will be located at a heart of SAW and remain as a sculptural artifact after the Festival of Fire. I use the ‘The Cosmic Furnace’ concept as a metaphor to build a tie between the rich history of metal in myth and cultural development and the current progressions of deep mining and violation of the earth. It draws attention to the value of our resources and hopefully makes one think about how past actions affect the future and vice-versa. The Blacksmithing department shares the art of blacksmithing with a Weekend Blacksmithing Pass which includes an optional introductory smithing workshop with Luke Claymon, open studio time, and a featured Artist Talk and Demonstration. Advanced Blacksmiths can opt out of the workshop and work in the shop with support from SAW’s Blacksmithing Director. Whether you prefer a coal or gas fired forge, your fuel is included with your Weekend Blacksmithing Pass. The pass includes an optional Introductory Blacksmithing Workshop from 9am to 12pm on Friday, optional depending on prior experience, as well as shop access. The shop will be open till 10pm on Friday and Saturday nights and you are welcome to work on projects until 5pm Sunday. *There will be some restrictions to shop access during guest artist demo. For those who cannot join us for the whole weekend the Introductory Blacksmithing Workshop will also be available on its own. Patrick J. Quinn is the Executive Director at the Center for Metal Arts in Johnstown Pa. where he teaches resident blacksmithing classes and coordinates visiting artist workshops. Patrick has taught blacksmithing, fabrication, and tool making at Southern Illinois University, Hereford College of the arts, The Penland School of Craft, The Haystack Mountain School of Crafts, and The Adirondack Folk School. With a passion for sculpture and education Patrick uses forging as a vehicle to express himself sculpturally and uses toolmaking and teaching as a way to share what he find so intrinsic about metalworking with his students. With a firm belief in “quality work starts with quality tooling,” Pat uses this philosophy to forge the best possible tooling for the Center for Metal Arts and himself, as well as, making the Center for Metal Arts the best classroom it can be. Patrick is a 2015 Niche award winner, and has work in the Evansville IN Museum of Art and science permanent collection. His work has been featured in juried exhibitions such as “Transitions” (Belgium), and “Forge” contemporary forged metal design (UK), “Craft Forms”, “43rd Mid States Craft Exhibition”, “New York Silver, Then and Now”(Museum of the City of New York) and “Metal in Motion” (National Ornamental Metal Museum).